This is going to be my second season with my 2014 Harley-Davidson Ultra Limited. I really like riding this motorcycle it’s a lot more comfortable than I thought it would be. I’m going to throw this out there it’s the most comfortable motorcycle that I’ve ever ridden. The seat and the handlebars are pretty much a custom fit for me. I have often wondered how comfortable someone over 6 feet would be riding this motorcycle. It does have a few characteristics that I need to get used to. One of them is that the motorcycle does feel a little bit top-heavy. I consider myself to be a person that has above average strength. So I’m cool with it. You might want to eat your Wheaties before you try to muscle this motorcycle around. Also, I’m used to riding a Honda Goldwing which has a much lower center of gravity. With that said, I am very selective and careful on what surfaces I ride the Ultra Limited on. The Ultra Limited weighs somewhere around 940 pounds so it’s no lightweight. 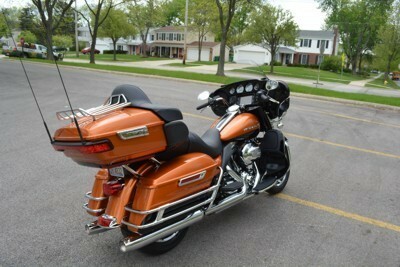 My Goldwing is damn close to 1000 pounds. The Goldwing has an inherent design advantage over the Ultra Limited due to the engine configuration. The Goldwing’s engine mass sits low in the frame, unlike the Ultra Limited’s engine frame relationship. So I was prepared and it wasn’t a really big shock. Either way, the Goldwing and the Ultra Limited are on the upper end of the motorcycle weight scale spectrum. So it might be a good idea to get a gym membership if you purchase either one of these motorcycles. You’ll need to pump-yourself-up! The other thing that I need to get used to is the bat-wing fairing. The fairing is mounted to the front forks and affects the handling of the motorcycle. 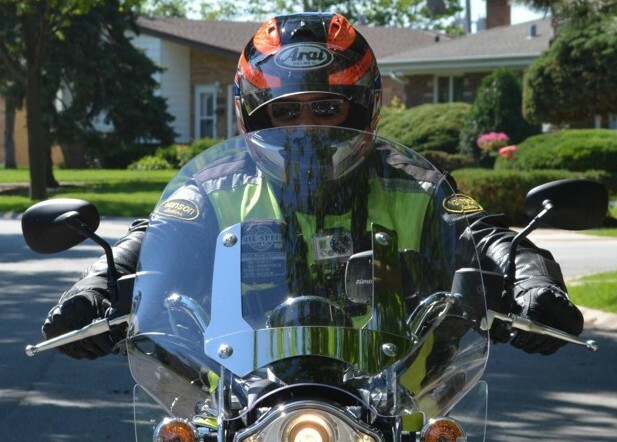 The front fairing on the Goldwing is independent of the front forks so it doesn’t affect the handling. I already knew that from reading several reviews in different motorcycle publications. Not the end of the world. I just have to plan and execute my turns with a little bit more precision. All in all, I’m in love with this motorcycle. I don’t mean “replace the wife love,” but I do mean motorcycle love. That’s right “motorcycle love.” Its a different type of love. I should get back on track now. The Ultra Limited has a lot of well thought out amenities that come in very handy during its usage. I’m very happy with the engine. If you have read other posts I’ve written, you know I’m a fan of the V-twin engine. 2014 was the first year Harley-Davidson incorporated a non-traditional cooling system into some of their engines. I did have the chance to ride this motorcycle during some very hot August days and everything was groovy. Okay the bad news. I went to pick up Ultra Limited from the dealer where it was being stored during the winter. Got on my motorcycle turned the ignition on switch and the infotainment system didn’t work. I got the green screen of death and then it went blank. Okay, not the end of the world, I purchased the 7-year warranty. I’ve got other motorcycles to ride, it’s all groovy. So I left the dealer without my Ultra Limited. The dealer called me about a week later and told me it was fixed. They told me they updated the software and so forth. The wife dropped me off at the dealer. Went to the service department and there it was waiting for me. I turned the ignition on switch and the infotainment system lights up with the Harley-Davidson logo. Yep, all good now! I pressed the start button and the motorcycle labors to start, but it starts. Okay, cool, put on my gear on and off I went. I removed the right side panel to get to the charging plug and connected to the trickle charger. The LED on the trickle charger is solid red which means the battery is being charged. The very next day, the LED on the trickle charger is flashing green which means the battery is almost charged. Day three arrives and the LED on the trickle charger is solid green which means the battery is charged. Yeah! I turned the ignition on switch and the Harley-Davidson logo appears on the infotainment system display. Cool we’re going in the right direction. I pressed the start button and engine comes to life without a problem. I ran the infotainment system through its paces. Yep, I’m ready for the summer now. I guess I won’t be making a trip to the nearest Indian dealer. So what did learn from this experience? Number one, I need to make sure my baby’s stored where it’ll get fed enough electric juice over the winter. Number two, if the battery is low on electromotive force the infotainment system will show you the green screen of death. Motorcycle conversation and a whole lot more!